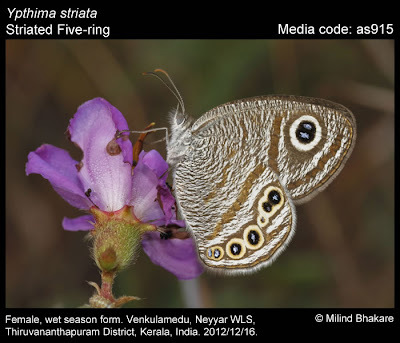 Thiruvananthapuram: Butterfly researchers were stunned when they accidentally met and photographed Striated Five-ring (Ypthima striata ), a rare butterfly from Neyyar Wildlife Sanctuary in Thiruvananthapuram district of Kerala during a recent butterfly survey, since the last records of this small butterfly from India dates back to 19th century. According to Dr. Kalesh Sadashivan, a butterfly expert and PRO of Travancore Natural History Society (TNHS), the record is the first one after 90 years, when the butterfly was last reported from Nilgiri by British collectors. “The highlight of the survey was the discovery of the Striated Five-ring by Dr. Kunte and Dr.Milind which is the only known record in the country in the last 90 years. It was never found after it was collected from the Nilgiris in the last century”, says a post in the official group of TNHS in Facebook. The butterfly was spotted near Venkulamedu near Anainirathy base camp inside Neyyar Wildlife Sanctuary by a team lead by Dr. Krushnamegh Kunte and Dr. Milind Bhakare during the survey. The photographs made by the survey team which are available Indian Foundation for Butterflies, could be the first live pictures of the rare butterfly from India. Historical records show that G F Hampson has mentioned about the butterfly in his “Butterflies of the Nilgiri District”, published in 1888. According to his accounts, he collected a male specimen of the butterfly from Nilgiris at 5000 ft on August 25th of 1888. He has mentioned the habitat of the butterfly as the southern slopes of the Nilgiris with an elevation of 2000 to 4000 ft. According to Dr. Kunte, the new discovery is very important since the first record is from north of the Palghat gap and is some 500 to 600 kilometers from the latest report. Thus the new record indicates that the actual distribution of Striated Five-ring is not just restricted to Nilgiris. Apart from the record of Striated Five-ring, the survey teams have also spotted Joker, an elusive butterfly which has been reported just twice from Kerala during the last 120 years. According to sources, the survey has recorded a total of 239 butterfly species among which 22 are found only from Western Ghats from Peppara and Neyyar WLS together. The teams has reported 186 species of butterfly species from Neyyar WLS and 153 species at Peppara WLS. The findings of the survey may be published into a booklet detailing the butterfly diversity of Peppara and Neyyar Wildlife Sanctuaries, said sources. The three-day butterfly survey was jointly conducted by Kerala Forest Department and Travancore Natural History Society during December 14th to 16th. According to TNHS, More than 30 volunteers from different parts of the country took part in the survey. Now watch two mating Common Fivering butterflies after the break. Western Ghats has many such butterflies which were only recorded by British explorers in the last century. Hope we will find more such rare and endemic butterflies in thee future. And what a beauty it is! That is the unknown beauty of the mother nature. Thanks for the comment.